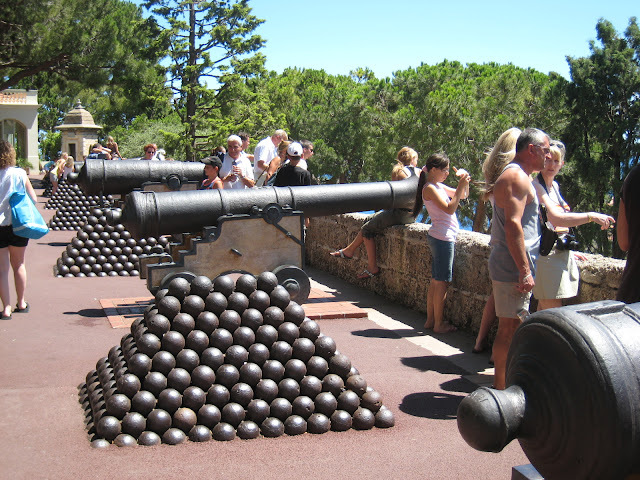 Monte Carlo Weekly Photo: Cannon! jilly, you can feel free to delete this comment but I just have to say that is an impressive display of balls. Nice photo, too. I wouldn't dream of deleting it! I agree...well said. Interesting. Nobody is paying any attention to the canons or their balls. Interesting just to see the interest of the tourists. Now, another use for cannonballs? Hmmmmmmm. I don't know! On second thought, I just hope all those resident and tourist dogs over there don't mistake these stacks for fire hydrants!